It’s not the size of the gun, but knowing how to use it that matters. Quietly? Clearly there is a role for stealth in the military. Regular readers will recall we predicted just this sort of thing Marines To Allow Females In Ground Combat and Resolved: Women In Combat Results In A Suboptimal Military. Women should not be in combat because allowing women in combat results in a fighting force less optimal than one comprised of men. As the opening quote shows, we were right on both counts. Currently, women recruits don’t have to do the same work as men. Instead of doing pull-ups like men, women are allowed to hang from a bar for at least 30 seconds. Hang from a bar, I repeat. Just like you see kiddies doing on the playground. Now why is that? Why would the Marines be afraid of losing those specimens who can’t do the job required of them? Don’t we want the military to retain those who are unable? Do we want to have a quota of those who are unable but who have certain politically desirable demographic characteristics? the ability to pull-up one’s own body weight over a bar shows the upper body strength that, in combat, is needed to lift fallen comrades, pull one’s self over a wall, and carry heavy munitions. From this it follows that the inability to pull-up one’s own body weight means that one cannot lift fallen comrades, pull oneself over a wall, or carry heavy munitions, you sexist. In other words, the hell with the evidence. Politics dictates truth. The American military is very good at doing what it is told. If it is made to enforce quotas, it will with alacrity. Combat roles are necessary for promotion, so without combat no woman would be promoted to top slots, which is politically anathema. Some commanders, no dopes, will shuffle personnel around so as to avoid the worst, so that the women under them are “in combat” but only on paper, e.g. piloting a drone miles away from the bullets. This is necessary for the statistics to match desire. This will fool most civilians and all reporters. But when it gets out that it is happening the practice will be stopped and the women formerly coddled will be shipped to the front. There they will die and be injured at greater rates, and cause to die and be injured at greater rates their compatriots. This will necessitate a creative bit of statistical wrangling, but it will be shown that, even though women become causalities at much higher rates, the announced rates will be the same or similar between men and women. Somebody will use the phrase “You can’t compare the direct rates.” This will convince reporters. Sexual harassment charges will increase (“He said I dropped out because of my period”, “He called me a woman.”). A few exasperated commanders will loosen their lips, tell the truth, and be fired. Reporters will call these men sexists. It won’t be too far into the future when “transgendered” people demand roles. I have the idea the government thinks it can get away with all this because it doesn’t see itself fighting many traditional ground wars. The harm done, they believe, will be small. Acquiescing gets the politicians and activists off their backs. Let’s hope they’re right. Acquiescing will keep the Pentagon budget from being cut more than it would otherwise. That’s the bottom line. The top brass still figures it can “win” (ie, not lose) any military action despite the degradation of its capabilities, so what’s the point of fighting on another front. A strategist might advance the PC agenda as quickly as possible to show how much of a fantasy it is and while there still is time to recover, but the risk is too huge for anyone to dare. The informal name for the Army Infantryman (I suppose now Infantryperson) is grunt. I’m sure women can be trained to move, shoot and communicate as infantrypersons, but few will be able to grunt. Grunting means carrying everything you need for 3 days of combat on your back (68 to 85 pounds), plus 100 rounds of linked machine gun ammunition, three 60mm mortar rounds, several extra batteries, medical supplies, 3 antipersonnel mines, 1 antitank mine, then moving tactically with all this weight 25 miles day-after-day-after-day. Grunts move logistics on their backs. Doubters will suggest the Army has trucks to move this stuff. Ask infantrymen in the 10th Mountain, 82nd Airborne, 101st Air Assault, and Ranger Regiment about trucks? I think we need to induct all women (and men) who advocate this into mandatory 3 year tours as a grunt. Pull ups are interesting but grunting is convincing. Of course, the military does not think or do. Acting individuals in the military think and do. But, assuming arguendo a collective mind, the military will do what it is told with alacrity, regardless the consequences or what it thinks. It is a branch of the state (actually the bureaucracy), fully subsubsumed by it. P.S. The fact that people do stupid things in the name of “equality” does not mean that arbitrary restrictions are appropriate. Your claim that “allowing women in combat results in a fighting force less optimal than one comprised of men” would become much more plausible if “allowing women” were replaced by “requiring equal representation of women and men”, but as it stands it’s probably false. For one thing, increasing the pool of potential applicants would actually make it feasible to *raise* the standard and have the schmucks who can only do three pullups replaced by women (like the one in the video) who can do eight. War is not an extreme sport, any more. Now it’s robots and drones, cruise missiles, high tech disruption, etc. We need soldiers who can sit in front of monitors and push buttons, not Arnold types. There is no reason for any of our military personnel to actually be in a war zone, and plenty of reasons to avoid it. War is not pretty. Best to keep a few arm’s lengths away from it. Girls can work the machinery. Boys whose best feature is a strong back will still be useful but not really necessary. But why do some want women to perform the vile duties of war? Because they don’t understand the what and why of war. They are locked into a cultural gloss that paints war as GI Joe in hand-to-hand combat against aliens. It’s a movie that doesn’t (or shouldn’t) exist in reality. By definition, war is (historically) the takeover (wresting control) of territory (physical area and resident population) by force (or threat of force) usually (but not always) by an organized (and armed) militia. Modern war is no different, although “control” is a sliding subjective scale. One measure of control is over the opponent’s weaponry (WMD’s, for instance) but otherwise leaving the opponent’s territory in their control. The more traditional desired outcome of war is total control over all the spoils, but in modern geopolitics Napoleons are rare. The modern control goal is to nix the threat, try to minimize collateral damage, but leave the “defeated” country otherwise alone. Hand-to-hand-house-to-house combat is for uncivilized nations. We in the civilized world eschew such nonsense. If we have to, we might send a drone-launched rocket bomb down their chimney, but we’d rather not do even that. As to sending our children (male or female) to foreign lands to shoot and be shot at like cowboys and Indians, well that’s just stupid. And yes, Virginia, our political leaders are stupid. We have to suffer their stupidity for awhile more, tragically. They are locked into an anachronistic (and hugely self-destructive) movie. Anybody who has studied this knows that on the average women have about 1/2 of the upper body strength and 2/3 of the lower body strength of men. There is no way the average women can meet the same physical requirements as men. However, as we know from the East German Women’s olympic team, women can train, build up lots of muscle and do amazing feats of strength. I really used to admire those women because they had everything I wanted. Big muscles, a deep voice, and a mustache. I can hardly wait for the formation of the 1st Amazon battalion. Quite right. Typo/mistake on my part. I meant, in the second, to write “government” no military. I’ll fix. Jim F: My guess is many women bought into the rediculous notion that men and women are equal and they want to prove they are equal. They are not, but they don’t seem to really care about reality. I agree with “Uncle Mike” that many women do not understand fully the concepts of war. Many just want to be “like men”. As to the pull-ups and push-ups, substitute dragging your “wounded” 200 lb partner out of the fray. If the woman can do this, over a distance that realistically represents combat, then she qualifies. And no, I don’t really expect that to happen. I think Briggs has a very accurate idea of where this all goes. I’m just saying that this would be more easily justified than the pull-ups. Every year during our physical fitness test I had to prove it in the ‘fireman carry”, and I always got someone who outweighed me by 30-50 pounds. @Uncle Mike – your idea that modern war can be sanitized is a repeating fantasy that’s been around for decades. So far, it’s always been disproven when real wars happen. I’m sure the women truckers captured in Iraq were thought to be in a safe role, too. In reality, every soldier is, first, well, a soldier. Reality can, and does, sometimes require rear echelon specialists to suddenly participate in combat. Correct me if I am wrong, but, I understand that women living together will end up with synchronized menstrual cycles. How many of these morons who have made this decision to put more women in combat would be willing to give a combat unit orders during this cycle??? Very sorry man but you belong in another era. 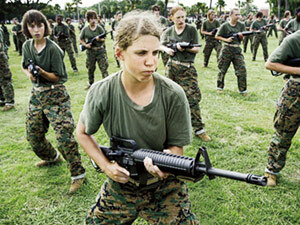 1-) Unlike some of you people may think(sorry to be impolite but this is the best term to apply) women have proven their skill in combat in the last ten years, even if they were not part of combat unit, they were often caught in situation where they had to exchange fire with enemies. 2-) I once watched a neighbor who got hurt in displacing 1 1/2 tone gardening cabin with 7 big tough men (8 total) and claiming how great they were. Meanwhile me and my father moved our 3 tonne cabin by ourselves using our head, and no one got injured. I could have done it with a 6 years. There are many ways to achieve something. it far from certain that brute force is the best one. 3-)the same complaint was made here about policewomen yet no one even mention them now. They are the police officer like any other man. They still get their guys. 4-) many countries around the world have integrated woman in their combat unit and they are still doing more than okay. kuhnkat: There are ways around the menstual cycle “problem”. The FDA approved a “no-period” birth control period several years back, which is also said to control PMS (which, by the way, all women are not subject to PMS). One supposses this would also be handy for women on the space station, etc. Sylvain: And who doesn’t notice female cops? The idea of out thinking the enemy in battle is not new. MattS: I guess my phrasing wasn’t very clear. I meant that at a point where a fallen comrade needs dragged out of a fire fight, if one cannot physically drag said person, coming up with a quick alternative might not be practical. You now have me wondering if we let women stratigize war, if that would be a good use of their talents. Hmmm. Where does this occur? As far as I know, only the Israelis used coed infantry units in the 1940s and the casualties were very high. Men didn’t want to be in those units. They gave up on the idea of women infantry. Does anyone who is so concerned about the degradation of our military have any actual evidence on which to base their concerns, or is this just alarmism based on vague fears and alarmism? Just located a new book on the subject. Forget about all the menstruation arguments and the arguments of unenlightened 1950s views of gender, etc. As a parent when it’s an actual person like Tiffany your daughter getting shot at, or your son Brandon that might get wounded and absent is someone physically capable of dragging him 200 yards to safety, then it gets a little more real. Something to think about: You have two platoons of about 25 people – one all male and one all female. All the members of both platoons passed identical physical requirements of push-ups, sit-ups, pull ups, etc. Both are going to see heavy combat and you are going to get assigned to one of those two platoons. Which one would you want to be assigned to? Would someone of the opposite gender of you answer this question the same way? Try to remove the politics and think like someone who may face death or inury in protracted combat over the next 72 hours. That’s when a social experiment becomes very real. True, but the better you are at out thinking the enemy on the battle field the less likely you are to find yourself in that situation. Also, all kinds of issues could prevent a male soldier from being able to drag a comrade out of a fire fight. As a parent when itâ€™s an actual person like Tiffany your daughter getting shot at, or your son Brandon that might get wounded and absent is someone physically capable of dragging him 200 yards to safety, then it gets a little more real. Whaaaa? Paul, do you really have any children you’d like to donate to a close range fire fight? What foreign country would you like us to ship them to so they can get shot at? As an actual parent of real children, I absolutely forbid them to go to a shootout anywhere. No need for my family to be cannon fodder for some nutball military adventure. If we need to defend this country, I say we use the big guns. Blow the enemy to Kingdom Come from far far away. Do not, I repeat, do not send anymore children to be killed anywhere!!!! Think about how we might achieve our nation’s goals without anachronistic mass slaughter of our own kids. There might be a better way. Have you ever been in a firefight in a war? You seem to know a lot about it. Was it a swell time? Did we win? What did we win? Couldn’t we have achieved the same results without getting anybody on our side hurt? The reality is that war zones are dangerous. Better to lob ordinance from a distance rather than put your body up close to the armed enemy’s. Think of all the stupid military actions this country has produced over the last 50 years. We did not win a single war, but we did get a lot of our own kids killed. For nothing. Pretty stupid, huh? But you folks can’t get out of the GI Joe movie. It’s hardwired into your pathetically propagandized brains that we just must send our kids off to be uselessly and needlessly slaughtered in hand-to-hand combat. You are stuck in a stupidity rut. Snap out of it, please. Soldier who fought alongside women in Iraq and Afghanistan had nothing but praise about how women acted in combat. Courage is not a question of gender. How did it work out between David and Goliath? How did it work out between aircraft carrier and battleship? The biggest tree can be uprooted by wind. There are many example that shows that doing something in another way is better than brute force. Everything has its strength and its weakness. I conclude few, perhaps none, that have commented have actually participated in ground combat. For those suggesting the need for ground combat is outmoded by high technology, try holding ground with a drone (UAV). The recipe for winning wars has been established for centuries: defeat enemy forces, occupy their territory, and control their people. Boots on the ground (infantry) are required for all three, and we lost Iraq and will lose Afghanistan because we didn’t occupy and control. If we can’t or don’t want to occupy and control, we shouldn’t fight the war! This bunch, some years ago, advocated putting [young] women on submarines with [young] men. That’s where they resort to “hot bunking” out of necessity. DACOWITS advocated removing necessarily military capabilities from the subs to build facilities to accommodate the women. I don’t recall what came of that, I hope the Navy won that political battle…. MattS–You are correct. Since we so little data on how often these things actually happen in battle (male soldiers don’t usually confess they could not drag a compatriot out of harm’s way), it’s just a guessing game. Perhaps it would be more correct to ask if adding women actually helps or hinders and not if it’s PC. After all, the point of war is to win, generally by killing and breaking most of the enemy and it’s territory. If adding women to that mix improves chances, then it would make sense. Uncle Mike: Perhaps one day when we bridge to an alternate reality, your wish for “peace on earth” can come true. Until then, there exists no evidence in history that humans have the ability to avoid war, other than via becoming slaves. Your choices are to stand and fight or submit and serve. Now, if you wish to state that you have no concern for anyone other than your own children and you care not if evil people make slaves of the rest of world, that is your option. Would you let an evil person take your wife and children and enslave them, rather than fight? Perhaps? Uncle Mike: Of course I don’t want my children(yes I am a father)to be in a close firefight. If the military and our government would listen to what I(and you) want and never put anyone’s children in harm’s way then I would concede the point. I’m talking about what happens not what I want to happen. See the comments by An Engineer. Sylvain: My question wasn’t about courage. No doubt female soldiers are mentally tough and courageous. If a female soldier could haul out a wounded soldier by hoisting him/her up on her courage this would be a different discussion. I think the other stuff you mention is evading the question. If you’re on the ground wounded and bleeding I doubt you’ll be contemplating David and Goliath or the merits of thought vs brute force, etc. Unless I have mistyped the genders (artificial construct that some purport it is)of those posting comments, the single female is NOT arguing that her gender should be on the front lines. Interesting, is it? So why the strong push from certain males — I perceive their arguments are more than simply arguments for argument’s sake? Jim Fedako, congratulations, you have picked up Briggâ€™s habit of using an anecdote to support a desired conclusion. …. we lost Iraq and will lose Afghanistan because we didnâ€™t occupy and control. Which planet have you been living on? Our combat troops occupied those countries for years and years. Our soldiers went door-to-door in those countries, seeking out bad guys to shoot up close and personal. But you’re right about one thing: we lost those wars. War is hell. If you want to fight a war, you better be ready to unleash hellfire. Don’t take a knife to a gunfight, take an atom bomb. Or else don’t bother. Either kill the enemy and kill him dead, or go home. Unfortunately, the USA has been all symbolic, waving flags, huffing and puffing, and sacrificing our flesh and blood for nothing. We are a jellyfish cartoon country with lots of smoke and mirrors but no backbone. Uncle Sam Square Pants. And it’s always the cowards hiding in their safe caves who monger for mass slaughter on an epic scale, because it makes for interesting TV. Cuts the boredom, you see. What fun to remotely watch someone else’s kids jab bayonets right into the (fill in the blank)’s eyeballs. War is not the Olympics. It is not a contest of physical strength. War is about killing the enemy. Might as well be high tech about it and do it from afar. Sacrifice the enemy; don’t sacrifice your kids, neighbors, and other allies. Your statement is “but the outgrowth of the conditions of your bourgeois production and bourgeois property.” Just kidding. Seriously, you can’t simply wave my statement away as a fallacy by committing a fallacy yourself. It would be better to answer the question: Who is behind the push for women on the battle lines? I do not hear it emanating from the greater mass of women. The last part of my answer was in response to Sheri. In combat you don’t know who will be the one to get injured. If it is 5’8″ 175 pounds guy he is not that hard to displace, but if it is the 6’4″ 250 pounds guy then you will need 2-3 guy to move him no matter what. The medic are often amongst those who get injured because they are the first to get into the open to care for a fallen soldier. In my experience I found that the best team are not homogeneous, they are diversified, but well intergrated. What you don’t want in your team is someone that downgrade others hability instead of putting everyone in the best position so they could contribute their maximum. Small woman can easily infiltrate in small hole giving more possibility and line of fire when entering a building for example. Sylvain: “Not homogenous” teams don’t seem to work well in politics if cooperation is the goal. If one had unlimited individuals to choose from, yes, a team composed of those who support each other is ideal. However, unless we reinstate the draft, it seems unlikely we can compose teams that all play well together in the military. They would have to be separated as to who wants to work with blacks, women, gays, etc. Very complicated. You can try to force cooperation, but you can’t monitor all the time and people, being who they are, will not support things they don’t believe in if they think they can get around it. You see that all the time in the current “tolerant, PC military of today”. They do not support certain individuals at all. Sylvain, understood about the end of your previous message. Heterogeneity of male physical characteristics makes sense. Gender heterogeneity doesn’t. If you want a female soldier to contribute then don’t have it be where strength and endurance is the difference between life and death for her or a fellow soldier. Her strength and endurance are limited by her genetics. To ignore that doesn’t put her in a better position to contribute and may abruptly end the contribution of someone else fighting with her. It also doesn’t mean she can’t make an important contribution but just in another venue. I do respect your right, though, to come back and say “I told you so” if you’re ever in combat and a female provides some added value that a male of the same height couldn’t. I never claimed that the possibility of having to drag a comrade out of a fire fight could be reduced to zero. That doesn’t make what I said untrue. That would fall into the category of out thinking the enemy. I agree, very stupid on the part of our leaders. It’s also a result, starting with Kennedy’s think tank, of thinking that we could beat enemies that were busy out thinking us simply by throwing better technology at them. Of course, my experience of working with women does not come from the military but from job that saw no women in years. Any time I worked on a team that included women we surpassed the workload of other all male team even when the work was physical. There is usually a better coordination in a team mixed of male and female. What you want to avert are the Terrell Owens of this world who are the best at what they do but so terrible a person that they never end up being part of a good team. That men and women are different is not in question. But combat duty is not simply about physical strength. This is true whether or not the team are mixed. Their are good teams and bad teams. Seal teams 6 the best seal unit doesn’t chose their member solely on the technical ability. There member have to go trough different interview and scenario where they are the leader and where they have to follow. The best is not necessarily the strongest, or the fittest. Forced cooperation doesn’t worked. Cooperation has to be natural to work. There are some standard that need to be met but what is in question here is a small amount of women being part of the regular infantry, we are not talking being part of the ‘seals’. Already few men are able to meet the standard imposed by the seals. Women should be able to try and meet these standard, if they can’t then they won’t join the seal. Regular army is much different. Sylvain: I agree with much of what you said. I am not objecting to women in the armed forces due to physical strength. I am curious how you know so much about the military. Were you in the military? Do you have relatives in the military? Otherwise, may we assume this is from what you read? Just curious. I’m completing my BA in history. Military history is one of my main focus and reading, and I do read a lot. to name a few but there are many others including national archives. You do have an interesting reading list. Have you actually spoken with veterans and people who are currently in the military about their attitudes? Real people don’t always match what book writers tell you. Actual conversations with a variety of veterans might yield a different perspective, especially on the gays and women in the military questions. In the long term, I would love to right a book based on interview of military personal and their experiences. I did a 45 pages paper on the 22nd battalion and their experience in combat which brought interesting result. For example: they spent a little more than a thousand days in France. Yet they spent only 18 days in actual combat. They never lost any grounds and only once failed to gain their objective. They also had one of the worst casualty rate at more than 60%. Most of their time was spent building trenches and training for the next offensive. While I do not doubt that some soldier would offer negative feedback most interview I saw were favorable to woman in combat. Sylvain: Your paper sounds interesting. I’ve read on the Israeli army and women. My problem with using this as a way to judge women in the military is that military service is mandatory in Isreal. I suspect that affects the attitudes toward women–in the US, women were not part of the draft. They could volunteer, however. The acceptance of women in Israeli military may be cultural thing or it may be the result of having a very small nation and the need for as many defenders as you can get. I hope if you do write a book, you can find veterans from both sides of issues, including those who oppose gays and women in the military. It adds to things if you can present both (or all) sides. What’s outside the quotes was added by me. This statement reeks of the elitist thinking that underlies all “progressive” thinking — the whole idea that our enlightened selves are somehow smarter than any and all generations of mankind that proceeded us. Ideas that fly in the face of thousands of years of accepted practice should always give an intelligent person pause. People who think we are in some new era of warfare where human physical force is less of a necessity are either ignorant of warfare in general or fooling themselves. This is a false argument at its root, anyway, because the argument is about whether women can perform the physical duties currently required of male recruits. These are requirements because, that’s right, they’re required of soldiers in combat at any time. Someone else asked if there was any evidence to support these concerns or if this was just alarmism. At least 3000 years of history lends weight to the idea that it’s better for men to do the physical fighting. Don’t be so stupid as to completely ignore that. Instituting lower physical Â standards for some recruits is by definition lowering the physical capabilities of the group as a whole. Any argument to the contrary is false. Better physical performance is an advantage in modern combat. Â Any argument to the contrary is false. It then follows that for two fighting forces that are in all other respects equal, the force with the lower physical performance is the lesser. Some may now attempt to counter this argument by claiming that the addition of women, while lowering the physical capabilities of the force overall, brings additional qualities that improve the force to a degree that outweighs the physical handicap, but that is very unlikely. It is far easier to find negatives associated with integration than it is to find positives. If women can be better pilots because their physical characteristics (heart to brain distance) give them an advantage in sustaining G forces I’m all for that, but do it because it makes the force more optimal and not to satisfy some idiot idea that we all have equal capabilities when we obviously do not. Â We live in a physical world with constraints dictated by matter, not a fantasy world with constraints dictated by politicians. For now. Yes, for 3,000 years at least — more likely 1.8 million years — hominids have been slaughtering their own kind in hand-to-hand tooth-and-claw combat. Right up to the present day. But warfare has changed. We have new weaponry today that allows us to shoot the enemy from afar. Pinpoint accuracy, guaranteed kill, from hundreds or even thousands of miles away. Today’s high tech weaponry was not around in WWII. Those were the olden days. Nowadays we have capabilities. Re the Holocaust: it was massive bombing and a tank invasion that defeated Germany and freed the death camp survivors, not hand-to-hand combat per se. Foot soldiers were necessary to support the tanks, and plenty died, including my relatives. I appreciate their heroic efforts. But that was then. Now is different. Now we can level a country remotely, if we want. We can also level it bit by bit, one chimney at a time, if we want. There are many modern instances of brutal regimes inflicting inhumanities on their own people. We decent people are appalled and wish to assist the downtrodden and oppressed. But it is not easy, even today. Look at Syria, now engaged in ruthless slaughter. There isn’t much we can do beyond humanitarian help in the refugee camps. We could bomb them flat, or we could selectively bomb them, or we could send our soldiers in to go house to house rousting out the bad guys and giving the children Hershey bars. None of those options will save anybody, and Option 3 could get our soldiers killed as well. I know what up close combat looks like, smells like, feels like. Been there done that. It’s a waste of life. There is a better way to kill people than up close. If killing is necessary, then by all means do it safely, from a protected command center a long long ways away. Uncle Mike: So you want to sanitize war–make it nothing more that a video game whose real targets you never even see? Can we dehumanize people any more than that? War is supposed to be horrifying. It’s what keeps us from wiping out invisible people we don’t like. There is nothing sanitary about blowing up the enemy with a cruise missile. But you are right: the inventors, manufacturers, and launchers of cruise missiles never see the enemy up close, nor do they watch him writhe in pain and then die. From the dead guy’s perspective however, the entire operation was pretty horrifying, even though he might have been anonymous, though not quite invisible, to his executioners. So I miss your point. Do you want your children (or your neighbors’ children) to share in the writhing and dying part? Why can’t you be satisfied with just the enemy’s painful death? We can snuff him from afar. We don’t need to watch him croak in person, especially when it could be dangerous around there. If you want to watch, we could send in a drone with a camera and hook you to a monitor. Unless you just have to be there corporeally, which I strongly advise against. My point was killing people in a far-away place where the consequences of your action are never seen by yourself or those engaged in the war runs the risk of making it easy to just “remove” those whom we don’t like. From the dead’s guys perspective–nothing matters. He’s dead. For a while, it might have some effect if we had a monitor, but sooner or later, the pictures on the monitor will just be part of some video “game” that we no longer have feelings for. War is supposed to messy, nasty and avoided as much as possible. If it’s nothing but a “video game” where people we never see die a death we never have to deal with, then there’s really no reason to avoid it, if you’re the one with the technology. No, I don’t want people sharing in the writhing and pain of war, but I certainly don’t want them regarding war as a video game with no consequences. Pain is necessary at times. It’s what keeps us human. Your contention seems to be that the ugliness and bodily risk of combat is painful to the combatants, and that’s what keeps us human. I don’t follow. Sorry. Your contention makes no sense to me. Perhaps you mean that the horrors of war will cure humanity of that particular folly; that we need for everybody to get a taste of the real thing in order to sway popular opinion against. However, decades of bodybags coming home filled with our children have not quenched the thirst for war. Not even yours. As to remote killing, the American people have been “killing people in a far-away place” for decades. It’s the non-combatants that support and pay for war. Our troops do not profit from spoils; they get tax-funded salaries. So, things being what they are, if you want our soldiers to kill someone for you, they would prefer to do it in a such a way that they don’t get hurt doing it. Otherwise do it yourself. I’m sure my contention makes no sense to you. No surprise there. I find it fascinating that even with NO draft and a purely voluntary military, somehow people are coherced into the military and forced to die in a foreign country for things they don’t believe in. Why can’t that same technique be used to make our enemies our pals? No, I do not expect the horrors of war to stop war. Just to hold it down. Unlike yourself, I have no objection to VOLUNTEERS who go to foreign countries to fight for what they believe in. I don’t suppose that the VOLUNTEERS are being forced to fight. I allow them to do it themselves, if they choose. You appear to choose for everyone and that choice is to stay home and lob missiles at people you don’t have to see. Enough said. We could go on forever and get nowhere. Waste of time, it is.